SIMPSON BAY–The local Red Cross chapter will begin visiting damaged homes in Cole Bay, Cay Bay and Cay Hill as the year-long Home Repair Programme continues. The programme provides materials to fix the roofs of people whose homes were damaged during Hurricane Irma in September 2017. The Red Cross also provides technical assistance to households that qualify for the programme, which aims to help Dutch St. Maarten residents with the greatest and most urgent needs. The programme is already active in Dutch Quarter, Sucker Garden, Middle Region, Over the Bank, Fort Willem and St. Peters where residents already have received visits and support for their repairs. Head of Mission Fanny de Swarte said she had hoped the Home Repair Programme would start sooner. The Red Cross prefers to work with local staff, but there was a shortage due to the amount of repairing and reconstruction that needed to take place. 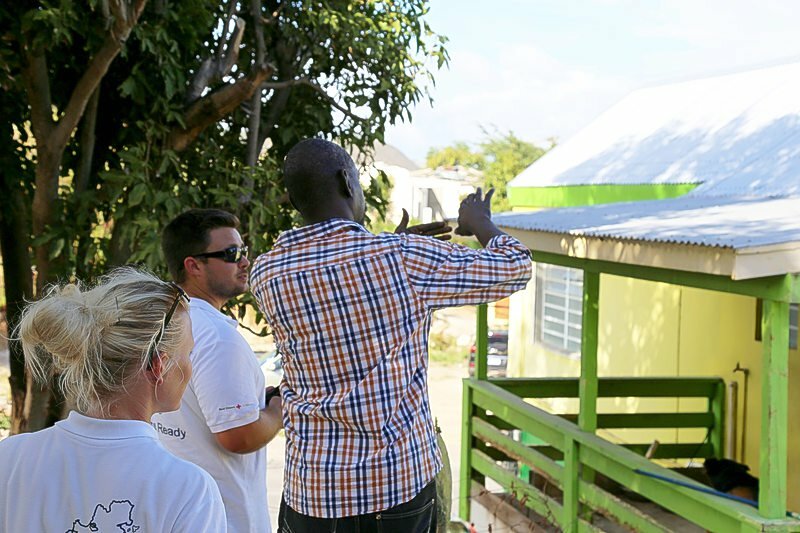 The Red Cross hired an international team of engineers and architects to provide quality technical advice to households here to improve their homes, a project that is part of the Netherlands Red Cross’ Hurricane Irma Recovery Mission. In the Home Repair Programme, Red Cross interviews residents to determine the amount of damage the house sustained and the amount of need the family or individual has. Eligible residents become beneficiaries of the programme and receive a bill of quantities (BOQ), a list of materials needed for their repairs. It takes about 45 days after the first visit for the Red Cross to completely assess the home and prepare the list of materials. It takes about 45 days after the first visit for Red Cross to completely assess the home and prepare the BOQ. Project manager Birgit Vaes said she is working toward reducing the length of time beneficiaries spend waiting between visits of Red Cross staff to ensure that people receive their BOQs and collect their materials by June 1, when the hurricane season starts. The Red Cross is hoping to collaborate more with other non-governmental organisations (NGOs) in St. Maarten in 2019. In addition to home repairs, the Red Cross wants to launch projects that focus on community-based disaster risk reduction, psycho-social support, work-readiness and vocational training intended to make residents more resilient. The Red Cross also supports the Waste2Work project, an entrepreneurship training and stimulus programme that operates on the island. The first start-up is an upcycle centre that aims to turn debris into, among other things, furniture. Red Cross staff and volunteers distributed more than 11,000 tarps, 8,000 food parcels and 116,000 litres of water in the weeks following Hurricane Irma. In the first half of 2018, the Red Cross provided vouchers to more than 4,200 households to buy groceries in the Food Voucher Programme, which ended in August. The Red Cross also gave more than 3,100 children breakfast and lunch every school day for several months during the School Feeding Programme, which ended in June. The Red Cross, through various programmes, has invested 8.1 million euros of money donated by residents of the Netherlands toward St. Maarten’s recovery. Residents can call the Red Cross at 545-2333 or 545-2304 to register or with questions. Dit bericht werd geplaatst in _Orkaan Irma+, _Sint Maarten, Politiek, SXM-Daily Herald. Bookmark de permalink .